$4,999.00 to $6,995.00 & FREE Shipping on orders over $59 $35. 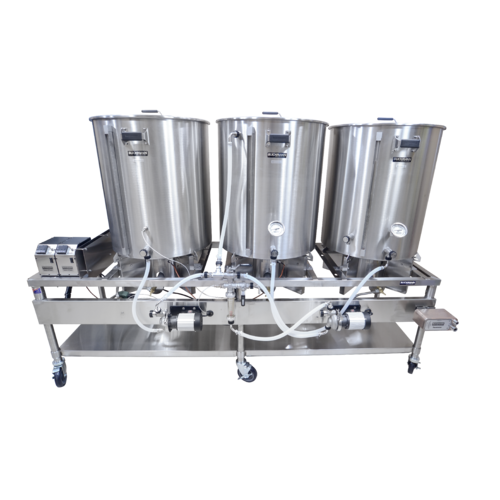 If you want a top of the line, gas-fired, 3 vessel brewing system then look no further! 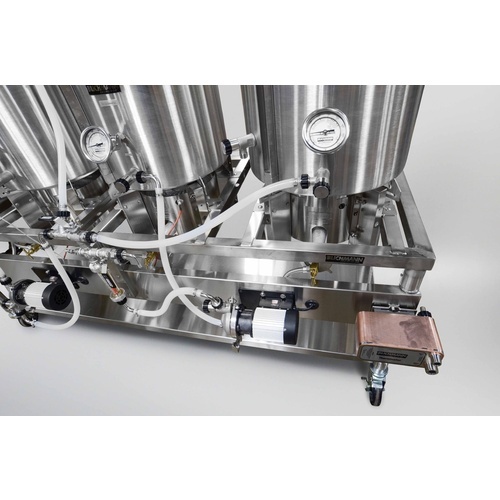 Blichmann has released their new horizontal brew systems complete with all of Blichmann's innovative products. The RIMS-style system comes in 5 different batch sizes listed above. 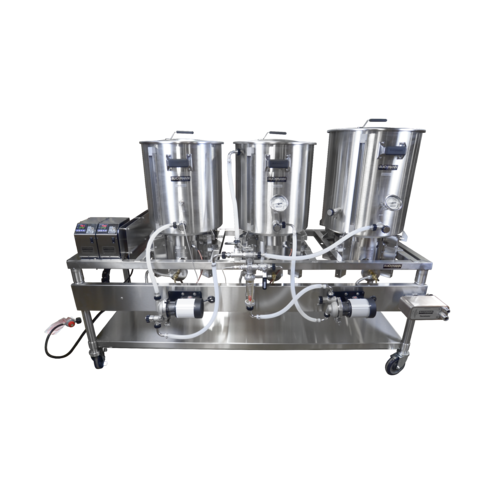 The system comes with 3 Boilermaker kettles, 3 HellFire Burners, 2 Riptide Brewing Pumps, 2 Tower of Power Gas Controllers, and the Therminator Wort Chiller, all on a large custom stainless steel table with the necessary hoses and fittings. The Boilermaker kettles are all made in the US from a single piece of heavy gauge, US made stainless steel. 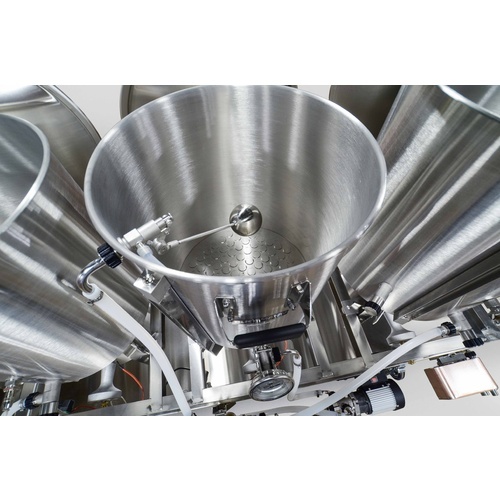 They come with Linear Flow Valves that allow for precise control of flow and disassemble for easy cleaning. Borosilicate sight gauges are mounted to the side of each kettle. 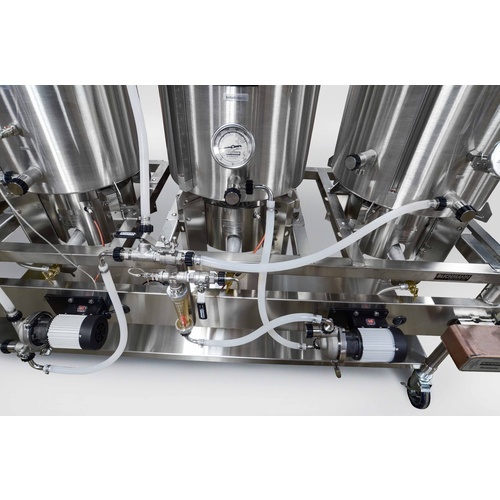 The diptubes all come with rotating racking arms to allow you to adjust them for clearer beer. 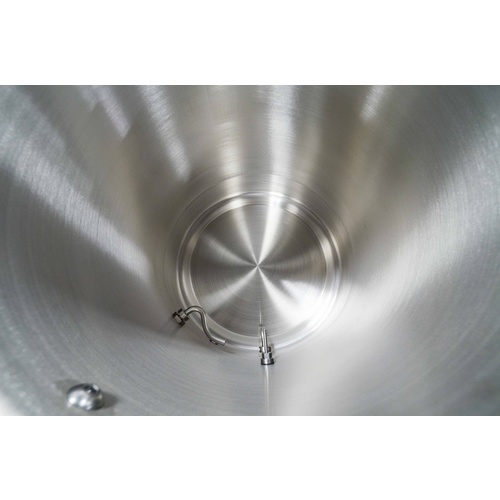 The mash tun comes with the patented button louver false bottom and Blichmann's AutoSparge. The boil kettle comes with a whirlpool fitting and an adjustable viewing thermometer. The HellFire Burner is a highly efficient burner with dual mode capability and is unlike anything else on the market. This custom made burner is tuned to operate in high efficiency mode, and also in a secondary high power mode. In the high power mode, you'll be amazed with 140,000 BTU/hr output for blazing fast heating - double the power of the previous design. In the high efficiency mode, you'll get 80,000 BTU/hr and superb heat transfer to the wort and whisper quiet operation. The Tower of Power temperature controllers give you precise control over the temperature of your mash and your boil. They come mounted to the table for your convenience. They come with a pilotless electronic ignition control system that will instantly relight your burner if blown out by wine, and will automatically shut down if a flame is not detected within 10 seconds. Also offers a Class A precision RTD temperature sensor, all in a compact, brushed stainless enclosure. These systems will ship free via freight with lift gate to anywhere in the contiguous United States. This gas system comes ready to use with Propane. To use with Natural Gas, see the conversion kit listed below in the "You Might Also Need" section. Please Note: This system requires one 120v 15 Amp GFCI outlet.